I joined the national youth team in 1989. From then until now, Yin Xiao has been my coach, and we were only separated for one year during that time. Yin is very career-minded. When I was on the youth team, the penholder reverse-backhand techniques were going through the early difficult phase of development. Coach Yin spent a lot of efforts with us to investigate the new methods. 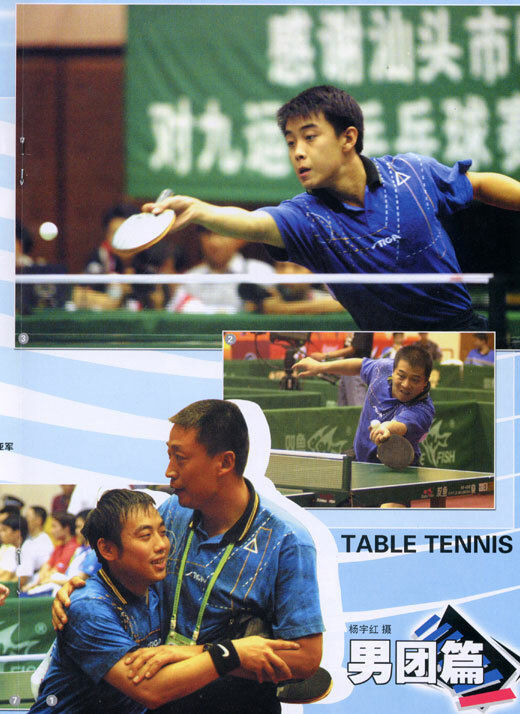 On table-tennis technques, Yin has always been ahead of his time. He has very original ideas, and is not afraid to let us experiment with those ideas. For example he worked with us on changing from pips to inverted, backhand loops, etc. As our primary coach, he did a lot more for us than help us train or supervise us in matches. He allowed us to express our own ideas, and he likes to develop our ability to explore ideas. When we have disagreements, he lets us resolve those disagreements through experimentation. He does not want us to just follow others. Whenever we come up with something new, he encourages us to try it; he always says that you have to pay your tuition fees. So I think that Yins style of coaching is a democratic one. Yin is honest and has very strong principles. He has quite a strong influence on the way Kong and I act as a person and as a player. When we were on the youth team, and also when we just joined the national team, we were among the youngest, and there were times when we loved to fool around. So Yin was very firm and strict with us. I remember our first trip out of the country, to play in North Korea. We did not do well at all and were eliminated early. Yin was very unhappy, and during dinner, he drank a little more than usual. He usually was very calm, but this time he scolded us severely. He told us how badly he had wanted us to do well, after all the hard work had apparently begun to give good results. He was angry that we had not tried our best, and that we did not feel any sense of urgency when the matches did not go well. He felt his hopes had been misplaced. At that time Yins wife just gave birth to their first child, and Yin had spent almost zero time with his family. He instead had focussed all his energy on us. So when we did poorly and showed no remorse, he felt anger as well as disappointment, as if his efforts were all in vain. When we saw how Yin felt and how his face was flushed, we were deeply touched, and we cried. That was the only time that I have seen Yin got so angry, and it left a deep impression on our minds. Since then, we have never let coach Yin get so upset again. In the 10 years or so of trials, tribulations and successes we have with Yin, he always understands the way we think and states of our minds. Before every major tournament, he always helps us fine-tune our mental states so that we can perform well. I really admire him very much for this ability. Just before a major event, the players will feel some degree of anxiety and restlessness. We want to be able to perform at the highest level, and we worry that we cannot do the best on the court, even though we may be in very good shape already. But in reality, it is almost impossible to play perfectly. So how we could adjust our mental states is very important. Yin always tries to communicate with us, and help us reduce that pressure, so that we do not feel that we are all alone. Let me give a couple of examples. Before the 1996 Olympics, our team was debating whether to send me or Ding Song, and I was finally chosen. I felt tremendous pressure; I was so afraid that I would let everyone down. During that time, Yin would talk with me everyday, on different subjects so that I could think more broadly. During the Olympics, he spent as much time with me as he could. No matter how late the matches lasted, he always waited for me so that we could have dinner together, and we could analyze my next opponent. He had been a source of great comfort for me. Then there was the 45th Worlds Mens Singles final match. After the semifinal, I had about 2 hours of free time, so I took my backpack and looked for Yin. I found him eating lunch at a nearby Chinese restaurant, so I sat down and ordered a glass of water to wait for him to finish lunch. When he saw that I wanted to talk to him, he got up and left with me right away. I told him that I felt a lot of pressure, and it was a different kind of pressure than before. I wanted to talk with him, but I told him I did not need to go into strategies or tactics; Ma Lin and I had played several years together, and we knew each other very well. I only needed him to talk with me for a while. So we found a quiet room in the tournament halls, and we started chatting. In real life, every athlete feels nervous before a match. We all get a little afraid of losing, and have a nagging feeling that things are not going well, but some of us handle this better than others. At the time I really wanted to win the match, because that was the title that I needed in order to fulfill my dream of being a grand slam champion. I would have no more regrets if I win, and this was probably the best chance I would ever have. Who could tell what would happen when they adopt the big ball the following year? So the more I thought, the more unsure I got. I told Yin that Ma Lin was younger and had excellent spirits. He was a great fighter. But I had more desire. Our styles were similar, and my advantage was my greater experience. I felt that I was not in my best playing shape, and the pressure was getting to me. So the pressure was due to my great desire to win this title. I had to tell coach Yin this, otherwise there would be too much I was trying to hold inside me. I felt better after telling Yin all this. After hearing that, he smiled and said that I was right. He said, "It is impossible to stop you from thinking about winning and losing. I feel that you should just try to think about it less. You should instead think more about your strategy, and the difficulties you might face during the match, so as to take some pressure off." So we talked about those things a little, and I started to feel much better prepared. I said I needed a little rest, and I found a metallic bench and lay down. Since I had not eaten lunch yet, Yin left me to get me a hot dog. Even though that bench was uncomfortable, I actually fell sleep. I had about 20 minutes of much needed rest. If I did not have that session with Yin, I dont think I could have won that match. Even though Yin is a very progressive coach, he is very conservative in other aspects of his life. He saysthat he can understand the way we think and act, but that does not mean he agrees. He does not talk all that much, and he likes chess, calligraphy and books; he is like a classic scholar. When he first started coaching me, he tried to correct my problem of not being able to concentrate for more than an hour or so. He gave me an exercise book to practice calligraphy on, and told me I should write a certain number of characters every day. After a week or so, I could not take it anymore, so he had to give up. Then he left me books next to my bed so that I could read more. When he checked our rooms, he would be very happy if he found that I have books and magazines on my nightstand. On reading, Kong was better than me, and Yin always told me to be more like Kong. I actually love to read martial arts novels, and I read a lot of them. Yin has been with me the longest, during my career on the national team. He has spent more time with me than my parents. I can say that in my development as a player as a person, Yin has accompanied me every step of the way. He is like a father to me. How Wonderful Is The 11-Point Format? 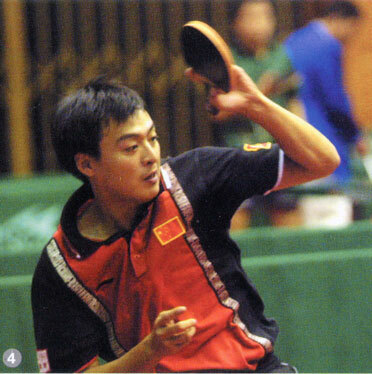 Since the ITTF adopted the 11-point scoring system, the Chinese men have not won any international tournament. 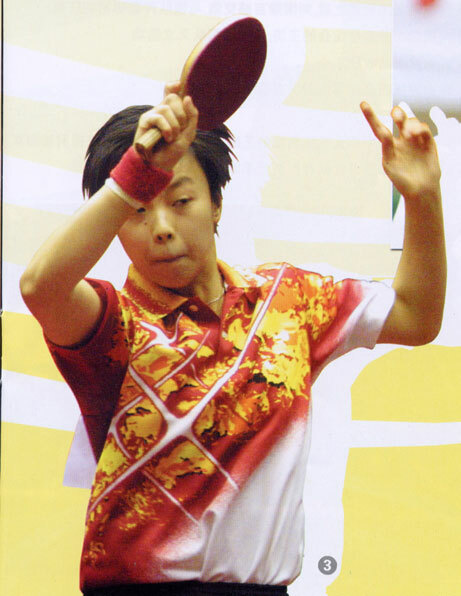 The just completed World Cup was won by Samsonov of Belarus, when Wang Liqin quickly lost 0-4 in the final match. How wonderful is the 11-point format? Reporter Bozza wrote this article to express his opinion. If I were to play a one-point match against Kong Linghui, I have a chance to win. The ITTF has found a way to let the reigning champions lose. The 11-point format signifies that table-tennis is becoming less like a sport and more a lottery where luck rules. This perhaps is the only way for the Europeans to break the Chinese stranglehold on table-tennis. The ITTF attempted to explain the change as a way to attract more spectators, but the bigger reason probably is to stop China. Since the scoring change, the difference in abilities between players seems less important. The great players used to have complete sets of strategy, starting from serving to gaining control of the rhythm and exploiting their own advantages. They need 5 serves to implement those strategies, to show their abilities to vary tactics, and to play to their best abilities for the spectators. If these players can only serve twice per rotation, they find it hard to implement these strategies. The lesser players can now strive to attack, and if they are lucky, they would get a lead, making the final results less predictable. Playing the 21-point format, these lesser players have much less chance. The contest of skill that the spectators wish to see is now less likely to happen. From a mental state perspective, the weaker players are now calmer, which is somewhat of an advantage. I should say the new scoring not only gives the Chinese trouble, but also make things difficult for the European champions as well. In last months Dutch Open, the final was played between Timo Boll and Tomasz Krzeszewski. After beating Samsonov in the semifinals, Krzeszewski continued his success against Boll. In his career up to that point, Krzeszewski had never got into the finals, semifinals, or even quarter-finals of any major tournament. He is only ranked 62nd in the world. But he became the Dutch Open champion. This kind of upset had never happened in the history of the sport. The question is whether the spectators expect to see Krzeszewski in the final match, and the answer is negative. In the just completed World Cup, many fans expressed to me their satisfaction. Some said that when they were just starting to seriously follow the match, it was already over. Others said that table-tennis is not interesting to watch, that there were too many breaks that interrupted the flow of the game, and that they could not get themselves into the game. These are not the thoughts of a few individuals. 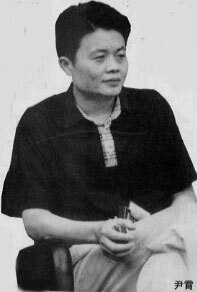 The 11-point scoring has made players like Wang Liqin, who excelled in the later stages of the games, hard to play their normal game. Wang had problems even with a much-lower ranked Canadian in an early round. He played better against Saive, and had a little bit of problem with Rosskopf. Against Samsonov, he was behind the whole match. From my personal observations, the new scoring will have less effect on Ma Lin and Liu Guoliang. This change should affect penholders less than shakehanders; Kong, Wang and Liu Guozheng will have more difficulties adjusting. Of course this is only my theory. The problem is that the new scoring makes the players want to score points as early as possible, and table-tennis may no longer be an intelligent sport. Its hard to say who will be the strongest under the new system. Some lesser players will have temporary successes, just like Krzeszewski has, and there is upset possibility in every match. But I believe that the Chinese will overcome this problem. They have survive under different conditions, and they will find a way to win under the new rule. The ITTF is trying different ways to limit the success the Chinese, but it will finally realize that their efforts are in vain. Although I won the ITTF Pro-Tour in both stops (Korea and Japan), I still have not grasped the principles of the 11-point format. I played the 11-point format for the first time at the Korean Open, and it was very different than the 21-point format. In the past, if I had a lead of 4 or 5 points, I basically felt that I would win the game. The first day I played someone from Taiwan, I should have won easily. But although I was leading by quite a few points, I still felt uneasy. The second day was better, but almost every point was critical, as if the score was 20-all. In the final against Ryu, I led by 4 or 5 points in the first game. I was thinking I have won that game and it was time to think about the second game. But before I knew what happened, I had lost that first game. In the second, I was leading 9-1, but I was still not confident. I kept feeling that the size of the lead was not important, and it was easy to lose 6 or 7 points in a row. After those 2 stops, I feel that the difference between the strong and the weak players is diminishing. No one can be very sure of winning, and it was easy to fall behind by one, two or even three games in a match. It appears that we need some time to adjust to this. But overall, I think the effect on me is not too great. During my service, I have less time than I would like. In the past when I had 5 serves, I could plan things carefully: how should I serve the first, and where should I place the next serve, etc. Now there are only two serves, and if the opponent gambled and got one or two points, I would feel the pressure. I dont feel uncomfortable playing 7 games. Before I played the Korean Open, I was worried that all those side changes would make me dizzy. When I was playing, I felt that the games went very fast; things were over quickly. Especially in doubles, where we played best out of 5 games. I was also not used to the serves: after 2 serves I was still prepared to serve more. The Koreans have practiced longer with the new rules, and they knew things like towelling every 6 points, while I was rather clueless about that. In the beginning I took the towel break after 5 points, and the referees stopped me. I ended up not taking any towel breaks from then on. Even though I won both stops, I did not play very well. Perhaps it was because I was not confident, unlike with 21-point games. Especially in the match against Ryu, where I missed several opportunity shots. In the 4th game I was leading 10-6, but I let her catch up to 10-all. Then I fell behind, and I finally won that game 15-13. If I had lost that game I would have been down 1-3 in games, and it would be hard to say who would be the final winner. The effects of the 11-point format are greater than we had expected. Our service sequence, the rhythm on the court, and the mental state are different than with the 21-point format. There is more randomness in the results, and upsets are common. In the past there were much fewer upsets in these Pro-Tour events. I played the 11-point games for the first time in Korea, and I felt awkward. Mainly there were mental differences. With the 21-point, I could start the game slowly, and get into the game after the first 10 points or so. Now if I fall behind by 3 points in the beginning, I feel that the game is getting out of reach. We used to have a cycle every 5 points, but now the momentum is stopped after 2 serves. After two good serves by me, I have to prepare to return the opponents serves. When it is my turn to serve again, I have to remember what I did the last time I served and how the opponent returned those serves. I need a good memory in order to link my serves together. Shortening the games to 11 points should help me a little, relatively speaking, since I tend to get into a game quickly, and I am a specialized player. In terms of calculating how to serve, I should have an advantage. Over the years, I have gotten used to the 5-serve rotation. I have a set strategy: how I should serve the first two, and how to place the following three. Typically the last 3 serves were more effective, because it is hard to serve well right from the start of the rotation. That is true with service returns too. The first two serves were like a test, and the last serves were more certain. Now we change every two serves, and it is harder to guess what the opponent is thinking. Since it is harder to have a set sequence of serves, the opponent can sometimes gamble and disrupt my game. There is more uncertainly now. With the 11-point games, each game is shorter, and we need to minimize mistakes. Sometimes one mistake can cost a game. Compared to the increase in ball size, the 11-point game is a more benign change for me. Mentally I am not afraid of this kind of contest. Whoever gets into the game sooner has an advantage, and we have to play every point as a critical point. I believe those are my strengths. So overall, I like the 11-point format. But since we have not played it before, we were at a disadvantage. The Koreans were more used to it than we were, and they had a better grasp of the rhythm than we had. With the 21-point format, players with very solid abilities like Wang Liqin, Kong Linghui and Samsonov did not show their strength in the first 10 points. Then they got stronger as the game went on. Now they are forced to get into the game right away, otherwise they would be under pressure. In my loss to Kim in Korea, I did not open the games well. When we played under the 21-point format, I usually started each game well. But this time, I fell behind 0-4 right at the beginning. It is now harder to come back from 4 points down. Playing the 21-point games, you can afford to have into the game more slowly, but with the new format, a couple of mistakes and the game may be lost already. Bai Yang and Niu Jianfeng of the 2nd-place Hebei team. 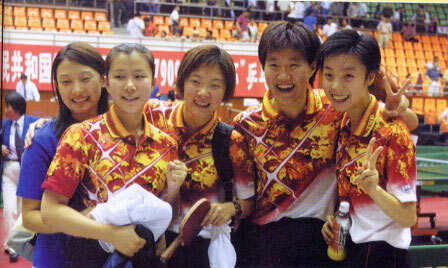 The champion Beijing women's team. Here are photos of Guo Yan and Zhang Yining. 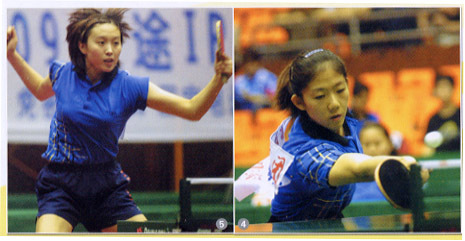 The luckless Feng Zhe and Wang Liqin of the runner-up Shanghai team. 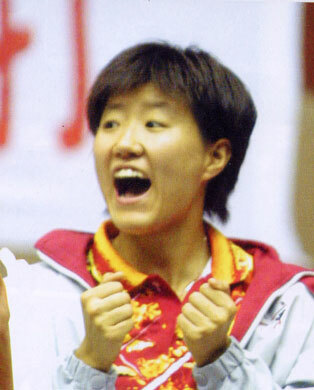 Wang was undefeated in the teams event. Feng blew leads against Wang Hao and Liu Guoliang to lose the two critical points in the finals. Wang Hao, Liu Guoliang and Wang Tao of the winning PLA team. Mens Singles runner-up Qin Zhijian.